Saddam Hussein's trial resumed Monday for closing arguments, a day after the former Iraqi leader was hospitalized and fed with a tube during his hunger strike to demand better security for his lawyers. Prosecutor Jaafar al-Moussawi said Saddam's condition had stabilized and he should be fit to appear in court this week. He was not present when the trial resumed Monday after a two-week break. Saddam began the hunger strike July 7 to protest the killings of three members of the defense team since the trial began in October. The latest lawyer attacked was Khamis al-Obeidi, who was abducted and slain June 21. The defense rejected an offer of the same security provided to the judges and prosecution lawyers: residence inside the Green Zone, the fortified Baghdad neighborhood where the court is located. Instead, they wanted bodyguards. Bombs killed more than 60 people and wounded more than 200 in Baghdad and the northern oil center of Kirkuk on Sunday — a dramatic escalation of violence as U.S. and Iraqi forces crack down on Iraq's most feared Shiite militia. A car bomb in front of a house Iraqi police had used as a command center in Samarra exploded Monday, killing two and wounding another 17, police said. The U.S. military has dismissed all charges against a soldier accused of killing an unarmed Iraq civilian near Ramadi in February. An Article 32 hearing found that Specialist Nathan Lynn of the Pennsylvania National Guard had reason to believe the man had a weapon. Saddam and the seven others have been on trial since Oct. 19 for the deaths of Shiite Muslims after a crackdown in the town of Dujail, which was launched after an assassination attempt there in 1982. They could receive the death penalty if convicted. Chief Judge Raouf Abdel-Rahman adjourned the session July 11 to give the defense team time to reconsider its boycott of the proceedings over al-Obeidi's death. The defense team has blamed the slaying on Shiite militiamen. The defense announced last week that it would continue the boycott, despite the judge's threat to appoint attorneys to deliver final summations. 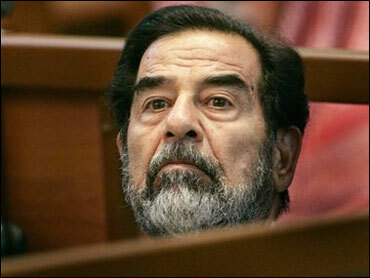 Two of Saddam's seven co-defendants were expected to give their closings on Monday. Saddam's half brother Barzan Ibrahim told the court during the session that he rejected his court-appointed counsel and asked for more time to find a new attorney or to convince his lawyers to come back. Abdel-Rahman asked him to listen to the closing argument of the court-appointed lawyer but Barzan refused and said he wanted to leave. "I have lawyers as your honor knows but they are passing through very difficult and critical times because three of them were killed and one was injured and is still in hospital," Barzan said. The judge ignored the comment and the court-appointed lawyer began his summation. Barzan was among the three defendants, along with Saddam and former Vice President Taha Yassin Ramadan, who had been refusing food. Despite more than two weeks without food, Barzan appeared fit. Meanwhile, Iraqi Prime Minister Nouri al-Malaki was in London on Monday for talks with British Prime Minister Tony Blair, before traveling to Washington for discussions with President Bush. During a BBC radio interview, al-Maliki was asked how long he thought it would be before coalition forces could leave Iraq. "Definitely not decades, not even years," he said though a translator. "I think in this visit we will discuss issues that will allow foreign troops to leave." While sectarian violence is still a problem, al-Maliki said, there would be no civil war. "There is a sectarian issue, but the political leaders have succeeded and they are working on putting an end to the sectarian issue," he said. "There is continuing efforts in that direction, the civil war will not happen to Iraq." Followers of radical Shiite cleric Muqtada al-Sadr on Monday denounced al-Maliki's trip to Washington, calling it "a vague and empty sign" and urged the prime minister "to cut his visit and not to sign any paper leading to occupation forces remaining in Iraq."